The Second Strategic Highway Research Program (SHRP2) R06E project, Real-Time Smoothness Measurements on Portland Cement Concrete Pavements during Construction, advanced real-time smoothness measuring technologies through unbiased field evaluations and demonstrations and the development of a draft model specification and guidelines. Furthermore, the study validated technologies designed to improve quality control and the paving process and enhanced understanding of the construction artifacts that affect smoothness. 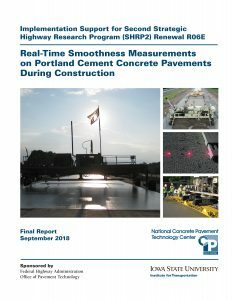 The Federal Highway Administration (FHWA), through the SHRP2 Solutions Implementation Assistance Program, funded additional work to continue development and implementation, with the goal to eventually achieve routine use of real-time smoothness measuring technologies by owner agencies and paving contractors. This report summarizes the implementation tasks performed in support of R06E. Tasks included developing an equipment loan program involving real-time smoothness measuring technologies, holding a showcase and conducting workshops, conducting case studies of projects that took advantage of the equipment loan program, refining the specifications developed under R06E, and engaging in a wide array of marketing and outreach activities. View the final summary report here. For more information about this research initiative, click here.